Here&apos;s your chance to break away and enjoy the exciting novel that launched the popular Sandy Reid Women Sleuths Mysteries Series. When an almost-too-clever young law student in Philadelphia gets a life-or-death call from her estranged brother who just moved to Florida--she tells him to go to hell. She&apos;s holding an old grudge and resents having her life interrupted. The brother doesn&apos;t have a clue about women and got seduced and framed for murder. He wasn&apos;t looking for trouble, he simply wanted to get past his divorce and start a new life in Florida. He hasn&apos;t bothered with his estranged sister in Philadelphia for years, but now as a stranger in a hostile town she&apos;s his only hope. The sister doesn&apos;t need this. Yet, reluctantly she decides to at least check out her brother&apos;s predicament in Florida. 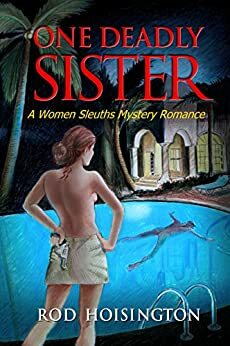 This small step leads her into an ever-increasing entanglement of deceit, double-cross, and danger, and to save her brother she must find the murderer and somehow persuade the attractive investigating detective to play things her way. "I like mysteries.... I like romance! Help me figure out what to read next." The novels in the Sandy Reid Mystery Romance series are fast-paced mysteries with a span of troubled romance and a dash of comedy; written in a compelling soft-boiled style you&apos;ll find enjoyable if you&apos;re tired of the usual formula mysteries. Neither Chick Lit nor Cozy, soft-boiled means it&apos;s gritty, on the edge and at times risqué, and you can count on some murders being in there--but you don&apos;t have to read about the gruesome details. It will get suspenseful along the way, but eventually the female protagonist will get all the puzzle pieces put together, will restore order and we&apos;ll all be safe once again. Sandy Reid, doesn&apos;t carry a gun, but nevertheless isn&apos;t intimated by bad guys. Bullets don&apos;t bounce off her, but threats, assaults and insults invariably produce a toxic response. Why should men have all the fun? Rod Hoisington lives in Vero Beach, FL. where he devotes full-time to his compulsion to dig into the souls and lives of fictional characters. ONE DEADLY SISTER is the first in the popular Sandy Reid mystery series. Followed by THE PRICE OF CANDY, SUCH WICKED FRIENDS, CHASING SUSPECT THREE and ALIVE AFTER FRIDAY. This was a new author to me and I did enjoy this book. It was a bit slow to get into, but it got better & better to the stage I was keen to read at every opportunity. I wasn't sure if I liked Sandy Reid at first, but actually enjoyed her character as I got further into the story. Definitely recommend if you enjoy light mysteries . I really enjoyed this book, it is a great read. I enjoyed the characters and can't wait to read more. Started but didn't get very far. I'm not a fan of stories that are based on a stupid decision that leads to the mystery or mayhem.